How appropriate that Eskgrove Homes should a launch their latest development in the middle of winter, when it is wet, windy and cold, and our thoughts are homing in to the prospect of even higher fuel bills. For Eskgrove, one of Scotland’s younger house builders whose own foundations were laid back in 2008, have quickly become known for concentrating on highly engineered properties that are super insulated and energy efficient. As a result, those settling into one of their new-build homes will find worries about high fuel bills vanishing into history. This latest venture from Eskgrove is located at Ballenlochan in Pitlochry. It’s homes are all bungalows with 2 styles available. One is a 2 bedroom Moulin, the other a 3 bedroom Kincraig. Already reactions to this new approach has attracted a very positive reaction from potential purchasers. Mr Cumberland added “This is our first development in Perthshire and we’re thrilled by the response we’ve had. Our style and method of build is truly unique and a change from the standard new build. It’s such a pleasure to have our customers delighted and enthusiastic about their purchase of an Eskgrove home”. What makes these homes so different to more conventional new build properties is the fact each one is built using a closed panel timber frame system rather than basic timber frames. These system are structurally and thermally engineered to Eskgrove’s standards and requirements, ensuring excellent thermal performance. The wall panels are made in Scotland and arrive at the building site complete with external cladding, insulations and plasterboard, as well as having doors and windows already fitted. “All materials are very carefully sourced and combinded with the precision of their assembly under factory conditions, the result is more accurately built homes than offered by tradtional means”. explained the builders. Adding to the efficiency of these homes is the fact they are heated by means of an air source heat pump to ensure it runs efficiently. Thanks to the extra insulations and air tightness of the exterior walls and roof, the heat remains within the building, another aspect that helps keep those fuel bills as low as possible. Another plus point is the fact the extra insulations is a feature of the internal partitions, so ensuring all rooms can be enjoyed in peace and quiet. But it is not only the structure of Eskgrove’s homes that makes them different from more conventional properties. The design of these houses add to their appeal. Exterior features include clay roof tiles, proprietary render and natural timber cladding. Internally ceiling heights of at least 2.7 metres add to the spaciousness of the accommodation, which includes the living room, dining area, sun area and kitchen, with the bedrooms and bathrooms also designed to be as spacious as possible. Overall space within the 2 bedroom bungalows amount to 934 square feet, with the 3 bedroom bungalows having 974 square feet of living space. All ten of the bungalows at Ballenlochan have private gardens plus private parking. 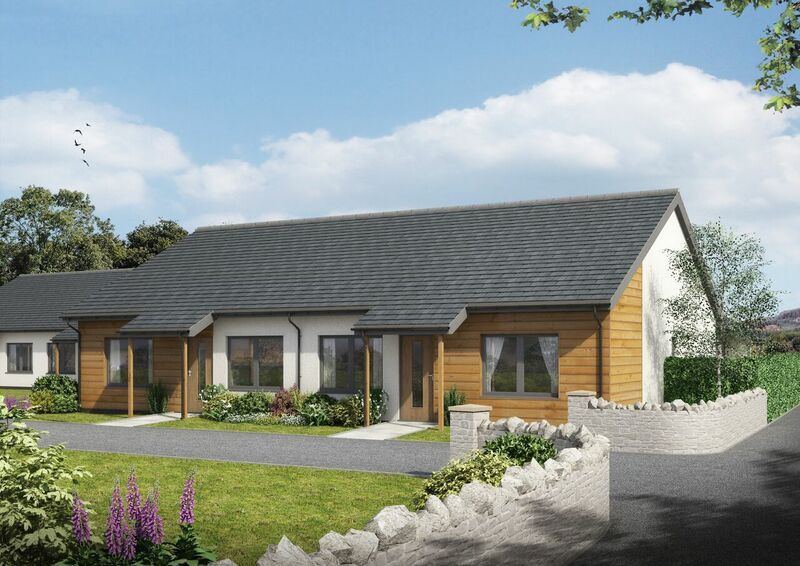 Prices for homes at Ballenlochan start at £239,000.